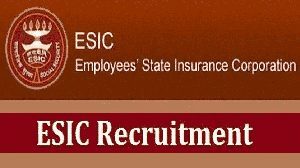 ESIC Gujarat Recruitment 2019: The Employees State Insurance Corporation in Gujarat invites online application of ESC Gujarat Recruitment 2019 for a total of 147 posts of Stenographer& UDC (Upper Division Clerk) for all the eligible and interested candidates, who are eagerly looking for a reliable Govt. sectors’ job. They as per the recently published job notification of ESIC can apply up to the last date of 15th Apr 2019. For applying to the ESIC Stenographer vacancy, candidates must have to possess the Higher Secondary or equivalent qualification from a recognized board/University of India. And also require having the appropriate working knowledge of Computer along with the knowledge of Office Suites and Databases. In typing of the stenography in Hindi/English candidates should have a speed of 80 words per minute. Along with is required having appropriate working knowledge of computer including the knowledge of Office Suites and Databases. Candidates who will be shortlisted have to be employed on the Level-4 of the pay Matrix and will get around Rs. 25500/- as an entry pay with the Pay Band of Rs.5200/–Rs.20200/- along with the Grade Pay of Rs. 2400/- as per 6thCentral Pay Commission. Application Fee shall be paid via Debit Card/Credit Card/IMPS/Cash Cards/Internet Banking & Mobile Wallets. In general, his/her age should be between 18 to 27 years. The military service rendered in the actual is deducted. For the ESIC Employee/Government Servant, who have attained a minimum of 3 years regular and uninterrupted service up to the closing date of the application receives. The applicant will get the status of ESIC/ Govt. servant at the time of appointment & during the selection event. 1. Phase-I is of Preliminary Examination. 2. Phase-II is of Main Examination. 3. And Phase-III is of Computer Skill Test. Step-5: If you feel that you meet the entire eligibility criteria are given in the guidelines, need to read before starting filing the application, then go back to the former page and click the link to apply online for ESIC Stenographer Recruitment and ESIC Upper Division Clerk Recruitment. Step-6: Here, fill every detail correctly is mentioned in the ESIC Application form and after completing, the filing, at last, hit the “Submit” tab. Step-7: On the next page of the application filing form, make the payment of the application fee through online mode only for ESIC Stenographer &UDC Recruitments. Step-8: After that, on the last procedure, take the print out of the duly filled application form for ESIC Gujarat Stenographer &UDC Recruitment for future use.